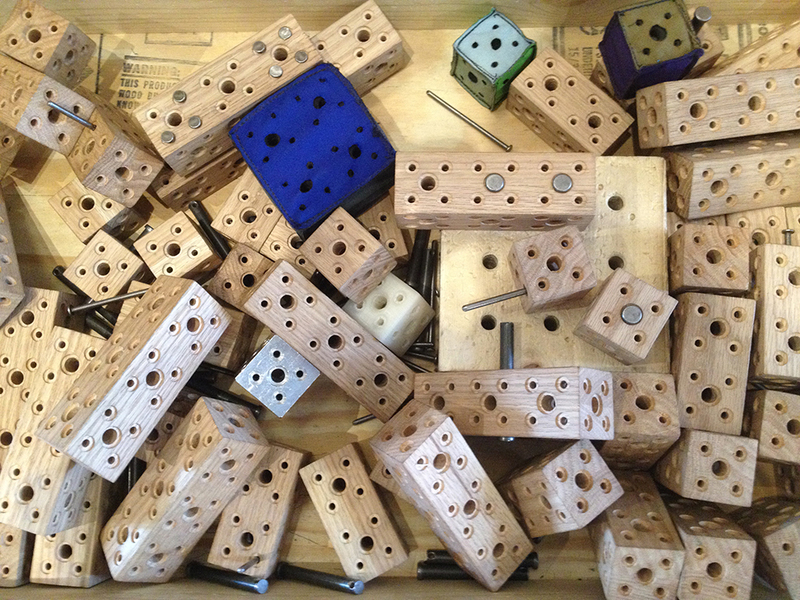 Every once and a while we decide to totally transform MAKESHOP to meet the needs of a specific activity. 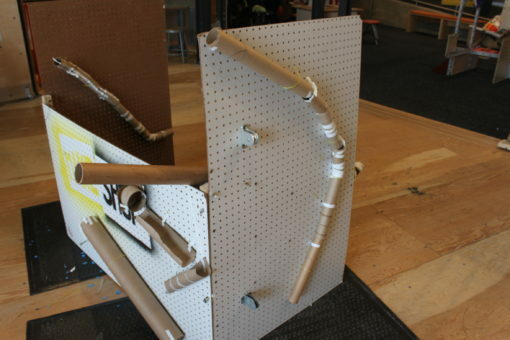 For the past couple of months we had been brainstorming some way to play around with ramps and “Rube Goldberg Machines” in our space. 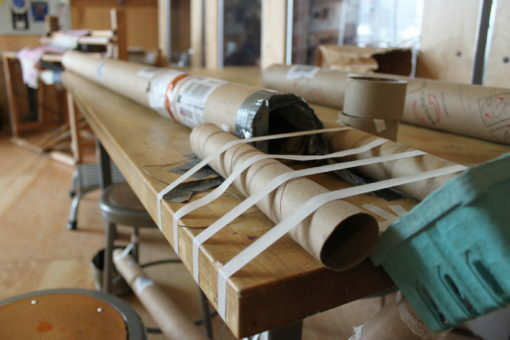 Around the end of December we were given a donation of hundreds of cardboard tubes. We took this as a sign that we should come up with some kind of ramp activity soon. 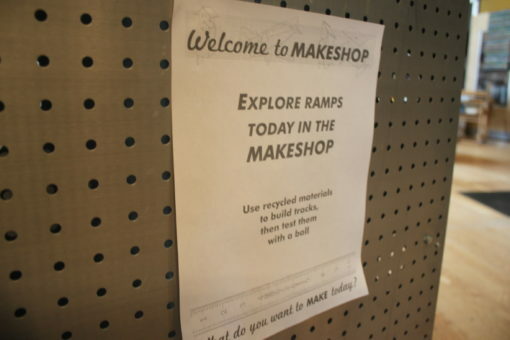 Our plan was to rearrange one of the areas of MAKESHOP to allow visitors to explore ramps on a large scale. We cleared out all of the tables from the center of the room and took a lot of our signs and projects off of the pegboard walls. We also assembled a couple of pegboard walls in the middle of the room for visitors to use as scaffolding for their ramps. We filled one of roto-bins with tons of cardboard tubes and provided tape, scissors, pulleys, string, straws and of course, ping pong balls. This activity took place over the span of a couple of days. I am not sure who had more fun, the visitors or the staff. We built a bunch of elaborate machines and ramps. 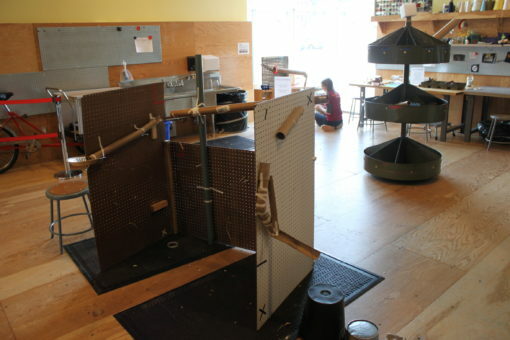 Visitors were free to play with the existing ramps or try to assemble something new. This was a lot of fun. There were some families that got really involved with this project and spent hours building and testing and playing. The room changed and evolved throughout the week. Things were moved around, new ideas were introduced and new ramps were built. My favorite moment came when a family experimented with adding one of our circuit blocks (a battery and a motor) to their ramp system. They were trying to make a motorized pulley that could lift a ball up in the air. We sort of got the machine working. It was a lot of fun experimenting with this idea. 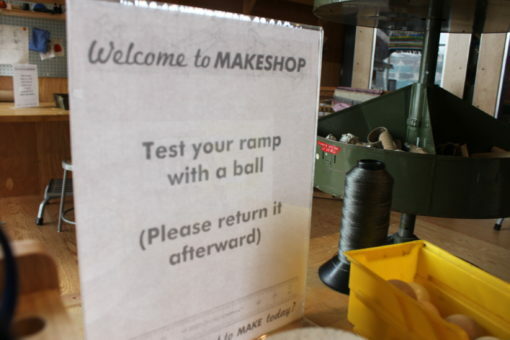 I am always glad to see visitors combining aspects of MAKESHOP into other activities. In the end we had to take most of the ramps down. We did however create a couple of magnetized tubes that we are going to keep out for visitors to continue exploring. I am sure that we will be finding ping pong balls scattered throughout the nooks and crannies of MAKESHOP for the next couple of months.